Illegal border crossings fell dramatically following the election of President Donald Trump in November 2016. Those numbers fell for six straight months before reaching historically low numbers. That trend reversed in May when the figures climbed back into Obama-era levels in October 2017. Since that time, the number of apprehensions fluctuated. 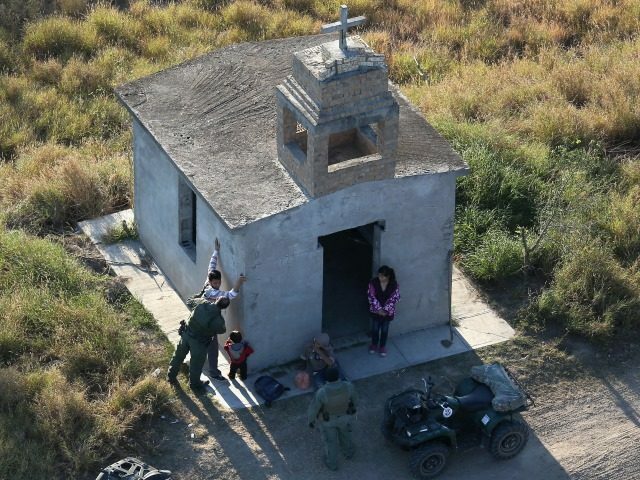 In February, the total number of illegal immigrants apprehended by Border Patrol agents increased from 25,978 to 26,666 (2.65 percent), according to the latest Southwest Border Migration report from U.S. Customs and Border Protection (CBP) officials. During that same period, the arrest of Unaccompanied Alien Children (UAC) decreased from 3,219 to 3,148 (2.21 percent) and Family Unit Aliens fell from 5,655 to 5,484 (3.04 percent). CBP officials stated these numbers reflect similar patterns from previous years regarding increases in migrant movement in February. Between 2012 and this year, except 2017, apprehensions increased from January to February. Thus far in Fiscal Year 2018, Border Patrol agents apprehended 136,201 illegal immigrants along the southwestern border with Mexico. During the same period in FY 2017, agents arrested 254,499. This represents a decrease in total apprehensions of 118,298 (86.86 percent) from the previous year-to-date numbers. The arrests of UACs similarly fell from 27,552 in the first five months of FY 2017 to 17,575 — a decrease of 9,977 (36.21 percent). FMUA arrests also fell from 57,265 in FY 2017 to 31,112 in FY 2018 year-to-date numbers. Agents arrested 26,153 fewer family units — a decrease of 45.67 percent). While apprehensions of FMUAs and UACs fell by more than half in the Rio Grande Valley (RGV) Sector, the agents in South Texas still continue to lead the nation in the arrests in all categories. Nearly 61 percent of all migrant arrests occur in Texas. During FY 2018, RGV Sector agents arrested 9,729 illegal immigrants including 2,923 families and 1,406 unaccompanied minors. Guatemala continues to have the largest numbers of UACs that are arrested by Border Patrol agents along the southwest border. Agents arrested 8,814 unaccompanied Guatemalan minors, 4,135 Mexican minors, 2,765 Honduran minors, and 1,385 Salvadoran minors. During the same period, agents also arrested 16,421 Family Unit Aliens from Guatemala, 9,382 from Honduras, 4,197 from El Salvador, and 843 from Mexico.